Honor Pabillion Houari Boumediene Airport. Argelia. Bohemian crystal has always been a key element in the creation of special atmospheres. Chandeliers represent the essence of this tradition. Nevertheless, there has been a shift from the common applications of crystal to a whole new world of decoration. This is not merely a passing trend. It is the continuation of an eight-century-old tradition. 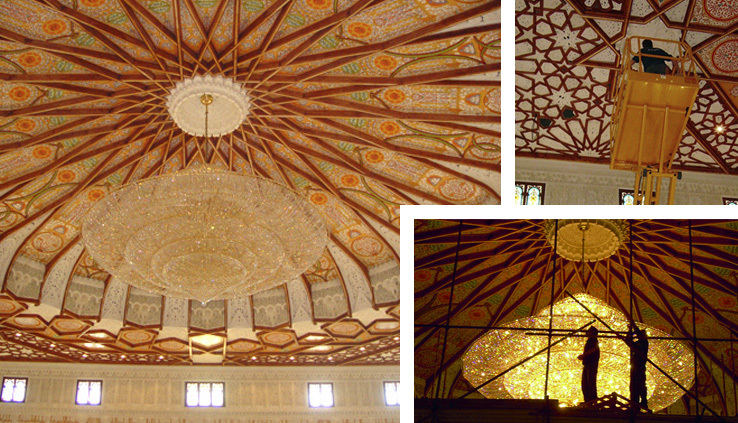 Ornamental lighting has been crucial in the decoration of the Hall of Honour at the Houari Boumediene airport in the capital of Algeria. Designing the lighting for a 5.756-square metre space is not an easy task. This challenging project entailed the exclusive creation of impressive chandeliers and lighting fixtures. As a result, the visitor enjoys the experience of indoor sunshine. Following a remarkable craft production process, the decoration of the hall took into account the meaning of every space, detail and reflection. As expected, the splendour of Moorish style architecture blends perfectly with the style of Bohemian crystal. The opening ceremony was held last March 13th and several dignitaries were in attendance, including King Juan Carlos of Spain. In this context, Iris Cristal chandeliers play a prominent role. Each piece is designed to accommodate specific environments, evoking subtlety and warm atmospheres. The reason for this lies in the painstaking work done in the study of lighting and its reflection properties on crystal. This exceptional blend of sensations is most evident in Iris Cristal chandeliers. In this respect, traditional Bohemian crystal manufacture melds with modern trends in decoration and interior design.